1. a. A mineral crystallizing in another mineral in the form of a branching or treelike mark. b. A rock or mineral bearing such a mark or marks. 2. A branched protoplasmic extension of a nerve cell that conducts impulses from adjacent cells inward toward the cell body. A single nerve may possess many dendrites. In this sense, also called dendron. Gk. devdpo.v, a tree; -eldhs, like, from eidos, form, shape. The Temple of Dendur in Lower Nubia is erected by the emperor Augustus on the bank of the Nile. The People's Chronology is licensed from Henry Holt and Company, Inc. Copyright © 1994 by James Trager. All rights reserved. A vast amount of the products and devices that we use everyday, everything from aluminum foil and soda cans, to cars, jet engines and computers, are made from metals and alloys. Early in the creation of all these products the metals are in a liquid, or molten state, that freezes to form a solid, just like water freezes to form ice. 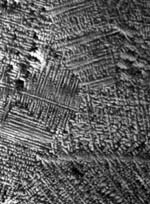 Now, if you were to look at some just frozen, or freshly solidified metallic alloy with a strong magnifying glass you would see that its structure is not uniform, but is made up of tiny individual crystalline grains. Moreover, If you were able to look even more carefully at the individual grains through a powerful microscope, you would see that each grain is made up from what looks like a bunch of tiny metallic snowflakes crowding and growing into each other. 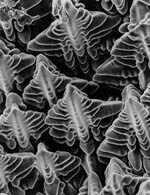 Scientists and engineers call these tiny metallic snowflakes dendrites. The picture to the right shows what a surface cut through a "forest" of dendrites in a metal would look like through a microscope. 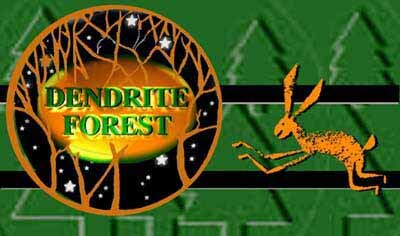 The term dendrite comes from the Greek word "dendron", which means a tree. This description is appropriate because we often describe the form and structure of a metallic dendrite as that of a tree (see figure to left), with a main branch or trunk, from which grow side branches, from which grow smaller side branches, and so on, until all the main branches and the side branches grow into each other and there is no room for any more branches to grow. The figure to the right shows a few dendrites growing out of the surface of a metal. In fact, almost all freshly crystallized alloys are composed of many thousands, or even millions of dendritic crystals all stuck together. What's most important is that the shape, size, and speed of growth of these dendrites are all factors that profoundly influence the final properties of cast and welded metals. For example, the dendrites affect how hard or soft a material is, how stretchable or springy it behaves, and how much you can bend or stretch it before it breaks. The dendrites also affect both how long and under what environmental conditions you can use an alloy before it wears out or rusts. The dendrites affect whether the material is a good or a poor conductor of electricity. The dendrites even affect how easily you can weld one piece of metal to another, and what's the best way to do the welding. In short, the dendritic pattern formed during solidification profoundly influences a material's mechanical, electrical, and chemical properties. The Isothermal Dendritic Growth Experiment ... in space!